Watch out George, make way for Sir Bradley! FOLLOWING the recent buzz of the Tour de France, Bristol is preparing to play host to a major cycling event. The fourth stage of the Friends Life Tour of Britain cycle race, featuring 108 top cyclists, will finish on Durdham Downs in Bristol on September 10. After an early morning start in Worcester, cyclists are expected to arrive in Bristol mid-afternoon - between 14:56 and 15:49. Local people and cycle enthusiasts will be able to catch a glimpse of the cyclists as they speed along the A4 Portway before turning on to Bridge Valley Road for a muscle-busting uphill sprint towards the finish line on Circular Road. The Tour of Britain, won last year by Sir Bradley Wiggins, is the UK's biggest professional cycle event, covering more than 1,375 kilometres. Bristol is the half-way point of the eight-day tour which starts in Liverpool on September 7 and finishes in London September 14. There are nine stages in total to complete. The tour’s visit to Bristol was initiated by mayor George Ferguson and ties in with the recent Mayoral Sport Commission report which aims to encourage more local people to take part in sport. 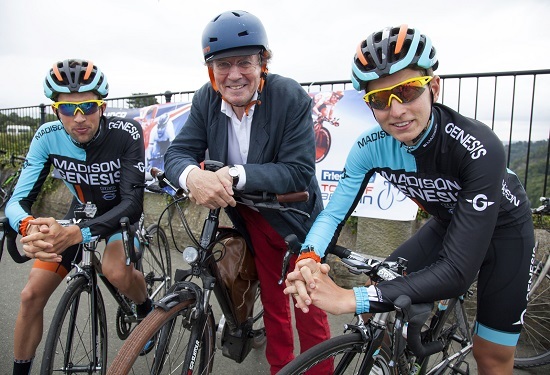 Mayor George Ferguson said: "I’m greatly looking forward to welcoming the Tour of Britain’s cycling elite to Bristol. It is a great opportunity to highlight how cycling is accessible to nearly everyone of whatever age or level of fitness." Ian Barrett, Sustrans Regional Director for the South West, said: “We know that there is huge enthusiasm for the sport and I’m sure the event will be a great success. The region already has some good cycling routes and we hope events like this will leave a lasting legacy." A recent council report produced using 2011 census data showed that the number of people who commute by bike in Bristol is double that of any other city. Fifty-seven percent of Bristol residents under 40 now cycle, walk or use public transport to get to work. For full details of the Tour of Britain’s visit to Bristol and a route map for the fourth stage, visit www.bristol.gov.uk/tourofbritain.